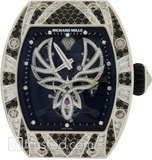 Richard Mille RM 003-V2 Tourbillon Dualtime Zone Watch 502.042.91 : This rose pink gold baguette diamond bezel case features manual winding tourbillon movement with hours, second time zone, power reserve, torque indicator and function selector. Also available in titanium, red gold or white gold and platinum. For the first time in watchmaking history and after years of research and development, a movement baseplate in carbon nanofiber has been created. 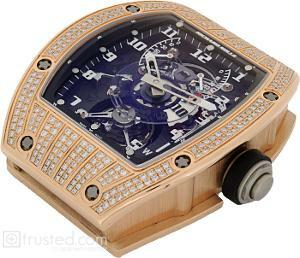 This innovation was first tested with great success on the RM 006, an experimental model. The technical results were remarkable and Richard Mille therefore decided to expand the use of carbon nanofiber further in his tourbillon range. Progress in this important area of development has now opened up a new era in watchmaking. CALIBER RM003-V2: manual winding tourbillon movement with hours, minutes, second time zone, power reserve indicator, torque indicator and function selector. This is an isotropic composite material created from carbon nanofibers molded under a high pressureof 7,500 N/cm2 and a temperature of 2,000ËÃ?Â?C, resulting in a material with high mechanical, physical andchemical stability in all directions. The ribbed perimeter of the movement plate assures the highest rigidity between the plate and bridges. Carbon nanofiber composite structures such as this are amorphous, chemically neutral and dimensionally constant within a very wide range of operating temperatures, including those outside of normal ranges. This stability assures the highest integrity of the movement’s going train under all conditions. Indicates a second time zone with numbers on a transparent sapphire crystal disc. These come into view when suspended above the light colored field located near 3 o’clock. The second time zone is simple to adjust via a pusher located at 9 o’clock. This permits better control of the torque applied to the screws during assembly. These screws are therefore unaffected by physical manipulations during assembly and disassembly and age well. • stainless - antimagnetic - suitable for tempering.